The purpose of this lab is to zoom into the components of mediated vocal performance by looking at the artistic potential of the use of micropones and loudspeakers in the theater space. 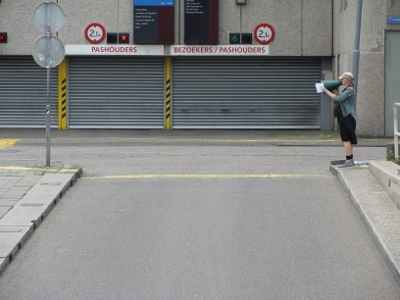 Together with composer Cathy Van Eck and sound artist Fabrice Moinet the participants will explore how various ‘dispositives’ (spatial, sonic and conceptual configurations) allow us to experiment with different registers of performance and listening. The lab is open to pracitioners who have a background in sound or radiophonic art, sound technique or (vocal) performance and who have an appetite for experiment and exchange. Introduction classes on voice and sound technique will be given by vocalist Anne-Laure Pigache and sound engineer Dirk Jonckheere. 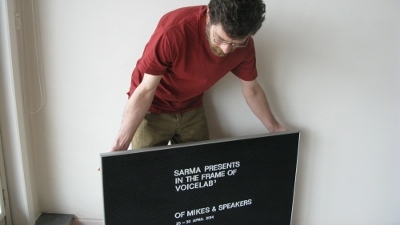 Open event on 26 April 2014: Speaking of Mikes, Speakers and Acoustics, an evening of artist talks, performance and lecture. "Confronted with microphones and loudspeakers through my own practice as a composer using electro-acoustic media, I investigated how microphones and loudspeakers could become musical instruments. Taking as an example some of my own works, I explain several possibilities of interaction with microphones and loudspeakers. " Fabrice Moinet staged a recording he made in Israel and gave a brief talk about his experience of performing sound in various kinds of site specific performances. Dirk Jonckheere (1964, Belgium) is an electronics engineer with a specialization in audio who teaches since 1997 on recording technologies, sound synthesis and acoustics at the Pianofabriek. 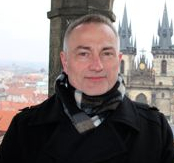 He is interested in the design and realization of acoustic structures and electronic instruments. Fabrice Moinet (1973, France) studied mathematics and science at the university of Bordeaux. During his studies he started focusing on acoustics and received the training to be a sound engineer. Parallel to his activity as a sound engineer, Fabrice had been involved in various project about finding peculiar soft- and hardware setups for contemporary art productions. 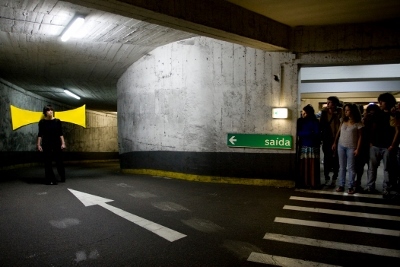 Based in Brussels since 2005, Fabrice collaborated with the artist group "Deep blue" and later "Field works" by performing the sound for many site specific performances (in hotels, offices, supermarkets etc) in various locations in Europe/Asia. 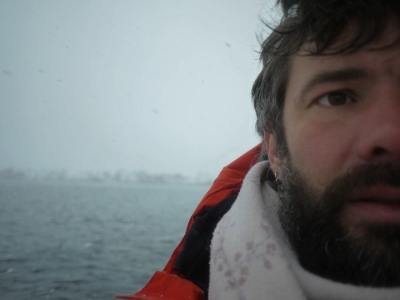 Recently, he made the soundscape for the show "Nothing's for something" by using flying helium balloons and small speakers and he recorded the Q-O2 project 'Radu Malfatti Quintet', a concert recording with musicians (Radu Malfatti, Christian Kesten, Julia Eckhardt and others) who research a relation between improvisation and composition. Involved into the sound and visual installation field, Fabrice collaborated with Christina Clar for "Voice and space" at q-O2 in 2008, Els Van Riel and recently with Christelle Fillod for the new project "Invisible Landscape" inspired by the Foulcault's pendulum. Passionated by the sound field recording Fabrice initiated "Timeline" installation project. With "Timeline-India" Fabrice propose to people to listen a one month of sound-field recording in India in a private and very simple manner. Anne-Laure Pigache (1976, France) is self-educated and developed a heterogeneous artistic oeuvre through multiple collaborations. The collective dimension is very present in her work. Today she is active as vocalist, improviser and author of sonorous poetry pieces. She has worked with voice as body and musical material since 15 years. She trains improvised musique, sings in different groups that use improvised music. She composes vocal pieces while integrating graphical elements and improvisation games. Her work can be situated on the boundary between sound and sense. Since 2012 she has been working on a typology of speech and its choral and musical potential. Anne-Laure Pigache conducted the workshop Handmade Radio for Voicelab2 in November 2012, and performed in Soirée Parole. Cathy van Eck (1979, Belgium/Netherlands) is a composer and sound artist as well as a researcher in the arts. Her PhD-research ‘Between air and electricity’ focused on the use of microphones and loudspeakers as musical instruments and was completed in 2013. Her artistic work focuses on the relation between technical objects and human performers and encompasses compositions with live-electronics, as well as performances with sound objects, which she often designs herself. She is interested in bringing the movements of the performer into an unusual relationship with the sounding result, mainly by electronic means. She is working closely with performers for developing her pieces, especially in combination with electronics. She often works in interdisciplinary fields, and collaborates regularly with theatre directors and choreographers. Her works are shown on festivals and venues like SPARK in Minneapolis, NYCEMF in New York, Klangwerkstatt in Berlin, Hapzura Digital Art in Israel, Avantgarde Schwaz in Austria, STEIM and November Music in the Netherlands and Spaziomusica in Italy. Since 2007 she has a teaching position at the department for music and media arts of the University of the Arts in Bern, Switzerland.